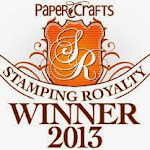 My Impressions: Simon Says Stamp June Card Kit (& GIVEAWAY)! Simon's Black Cardstock and matted it with a couple of the Echo Park Wedding Bliss 6x6 Papers before adding to the card front. If you're interested, you can pick up the Simon Says Stamp June 2017 Card Kit: Blissful for just $29.99 + shipping. If you'd like to receive this kit and future kits for only $24.95 + shipping per month, you can SUBSCRIBE HERE. 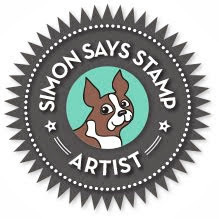 Heidi, owner of Simon Says Stamp, has given me an extra Simon Says Stamp June 2017 Card Kit to pass on to one of you! 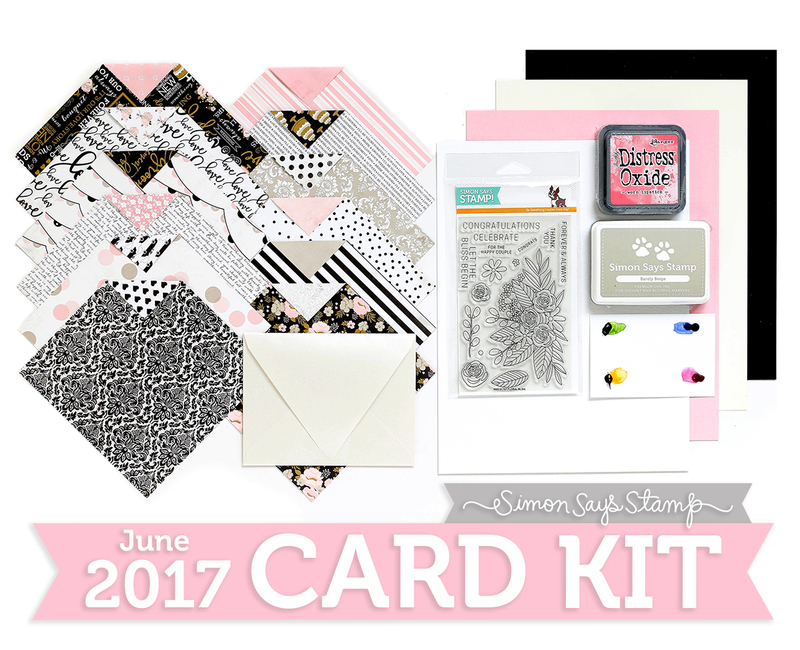 Just leave a comment on any or all of my June 2017 Card Kit posts and I'll announce a winner Friday, May 26th. Pink, white and black: My favorite colorcombination! A great kit! OH MY GOSH! What a gorgeous kit! I love your card. Thanks for the chance to win! Very pretty card...love the black and white with the gorgeous blooms. 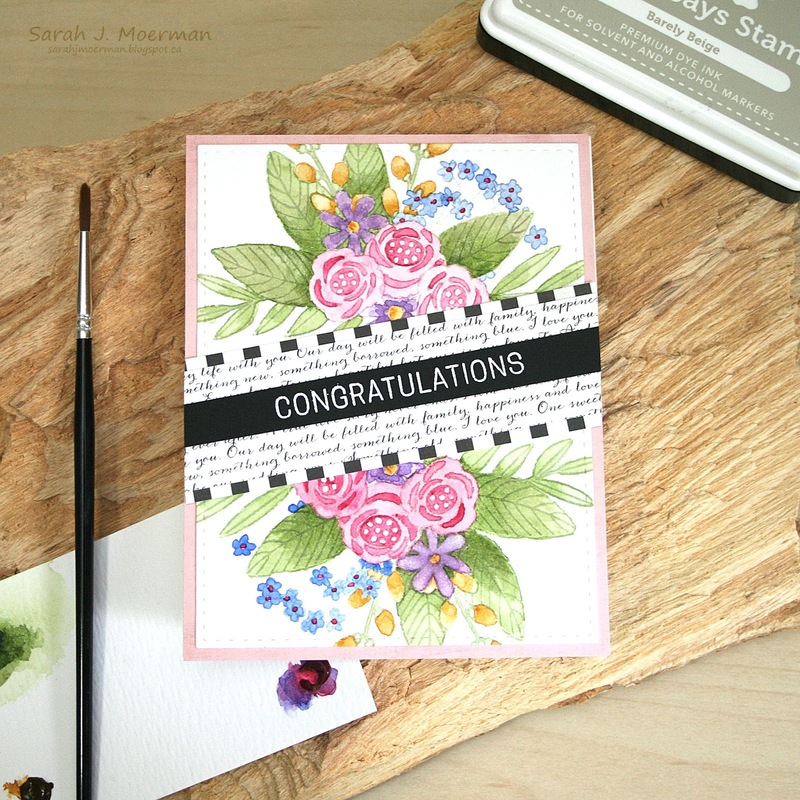 Love the soft colors in the watercolor pallet, and the way you doubled up on this sweet stamp! These papers are lovely together, too---and very versatile. Great kit! I love how you combined the beautiful floral image with a graphic black and white! Oh wow!!! This is gorgeous!! I love your watercoloring! Really like the way you used the pattern paper under the sentiment! Your card is so beautiful. Love the color combinations in this kit. 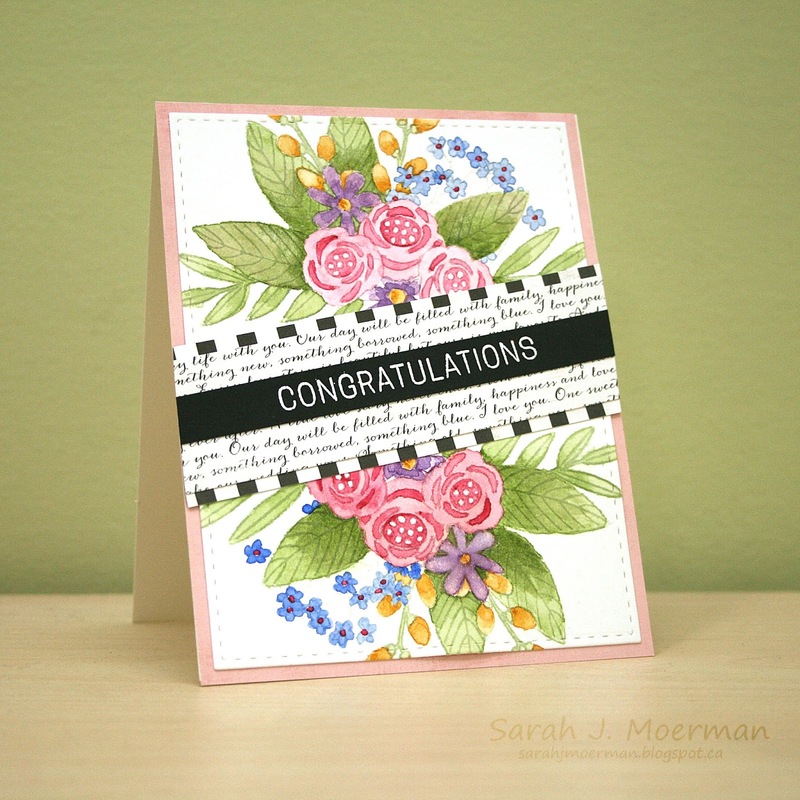 I love this kit and you showcased it beautifully with your gorgeous card! Sarah, wow! This is gorgeous! Your no-line watercoloring is simply amazing and you really made this kit shine! Oh Sarah - your card is gorgeous. Don't you just love the colors in this kit - and those flowers .... awesome. Gorgeous card, Sarah! I fell in love with this stamp set as soon as I saw it, and it seems I' not the only one. Love those florals & your color combo is perfect! Your design is going right into my little book of sketches for future reference. Love it! Wow! This is so beautiful!!! No one would ever be able to tell you used a stamp set, it looks free handed! Awesome!! Beautiful design and watercolors!! And a very pretty kit. Thanks so much for sharing. What a pretty stamp set, and collection! Thanks for sharing your creation. My sister is getting married next week, this would be a beautiful set for all those upcoming weddings this summer! You done a fabulous job on the card. I love the stamp set and the papers are wonderful. Good job showcasing the floral stamp. Love the water coloring. What beautiful painting you did on this card! Such a pretty card Sarah! 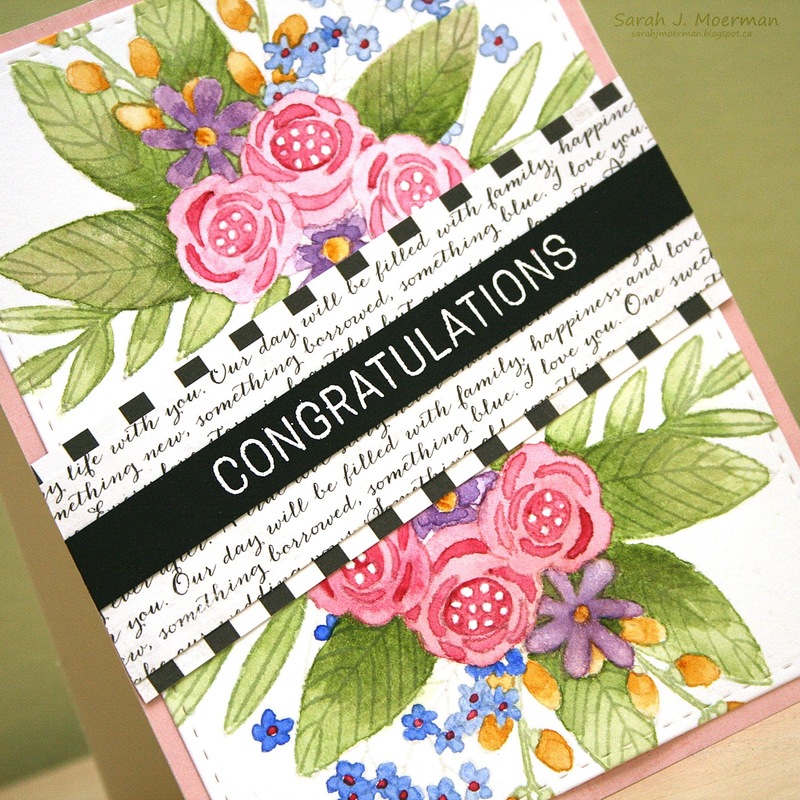 Love the floral stamp in this months kit! This kit is so nice, and I like the card design you made today. This is beautiful! I love water coloring with the Oxide Inks. Wow! Sarah, that is gorgeous and elegant. Stunning watercolored flowers. your cards inspired me to check the YES box for this kit. Oh Sarah, your card today is just lovely. I so want to make one like it. I also took a look at the others you made with this kit...beautiful cards. You really inspire me to craft a little out of my safety zone...trying something more difficult ( for me anyway). I follow your blog and have learned so much from you. Beautiful card. Your coloring is wonderful and the script background looks perfect.